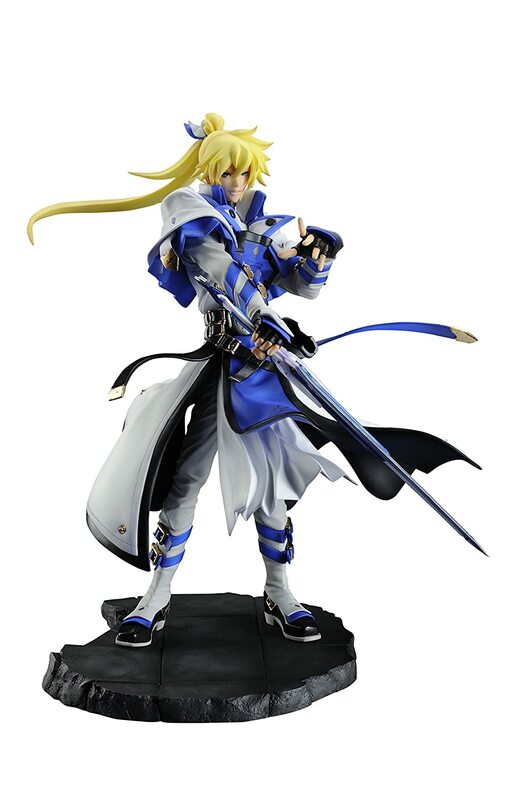 I love this Embrace Japan Ky Kiske Figure! Embrace Japan Ky Kiske is a great figure! This is one of my favorite figures. Ky Kiske is a character from Guilty Gear and this guy is 1/8th scale. In case you’re not familiar with Guilty Gear or just want to take a look at the game, you can find it right here. It’s a cool pose, a cool character, and from a great game. What’s not to like? I love how close the figure is to the in game character. He looks like he just popped out of the game. It has that simplistic anime look to it while still having plenty of details. Maybe I shouldn’t say simplistic, it has a clean and well-crafted look.His outfit is especially awesome. It has a cool flow to it. The gold pieces on his outfit have a nice shininess to them. I also like the color palette with blue, white, and yellow. In addition to his outfit, I love that you can change the hair and customize him a little bit. He comes with short hair, a long ponytail, and long hair. Just being able to set him up how you like him is a great plus! For this figures assembly, all you need to do is pop him onto the base and you’re done! As I stated above you can also remove and replace the hair pieces. I like that his base is shaped like tiles and it looks like he’s in an environment. Much better than some bases I’ve seen which are just a plain plastic piece. Finally, I love how well sculpted and painted the character is. All the folds are in the right places and it overall just looks really cool. It’s another Guilty Gear action figure you must have if you’re a fan of the series. Therefore I have nothing bad to say about this figure. You will not regret getting one! In case you’re looking for other figures, all of the Guilty Gear figurines I have seen have been really high quality. Check out some others I have written about including Ramlethal Valentine and Sol Badguy!